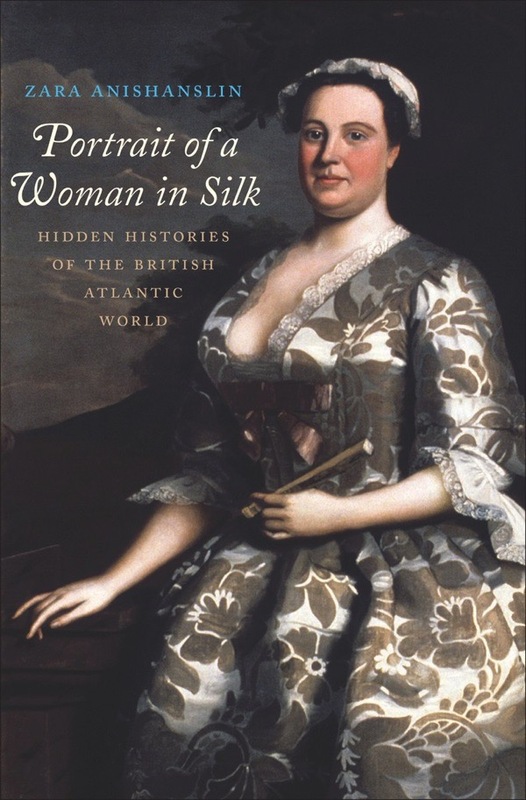 Zara Anishanslin, author of Portrait of a Woman in Silk, Hidden Histories of the British Atlantic World published by Yale University Press, profiles Anna Maria Garthwaite, the most celebrated textile designer of the eighteenth century. 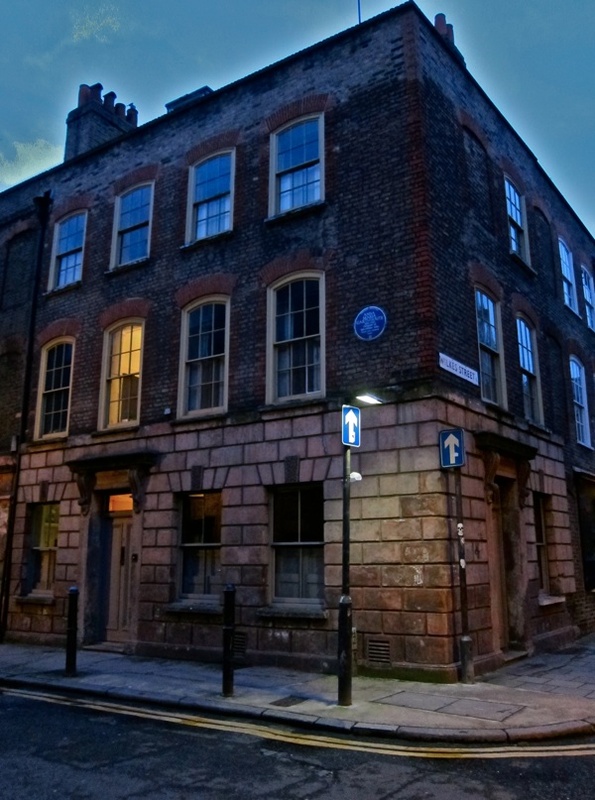 Readers are invited join the Zara Anishanslin next Wednesday 25th January from 11:30am to 1:30pm for a reading and book signing at Dennis Severs’ House in Folgate St. If you wish to attend please mail professorzara.com@gmail.com by 23rd January. Two unmarried sisters, one a widow and one a spinster, moved from York to Spitalfields at the end of the seventeen-twenties. It seemed an unlikely time of life for them to relocate, as both were in their early forties. But they were hardly alone in their choice. When the sisters arrived in Spitalfields, it was experiencing a building and population boom. They lived in Princes St (now Princelet St) only a short walk from the Spitalfields Market, which had been a local fixture since the sixteen-eighties. But their terrace of newly constructed townhouses had been laid out only a decade before. 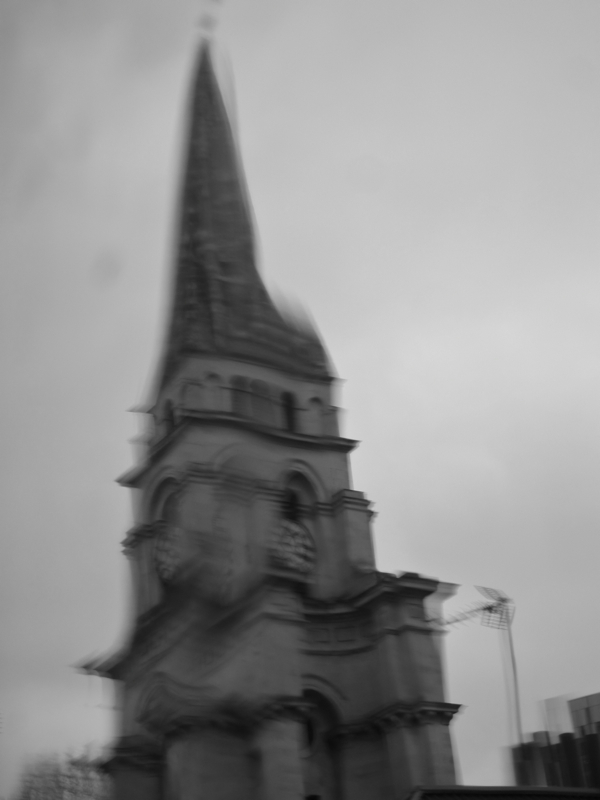 The neighbourhood stood under the shadow of architect Nicholas Hawksmoor’s masterpiece, Christ Church Spitalfields, itself just completed in 1729. The two sisters were drawn to their new house on one of Spitalfields’s newer streets by the same thing that had brought many of their neighbours there too. They came for the industry that became synonymous with the area in the eighteenth century: silk weaving. For when the two sisters moved to London, it was in part so the younger of the two, Anna Maria Garthwaite (1688-1763), could launch her career as a silk designer. 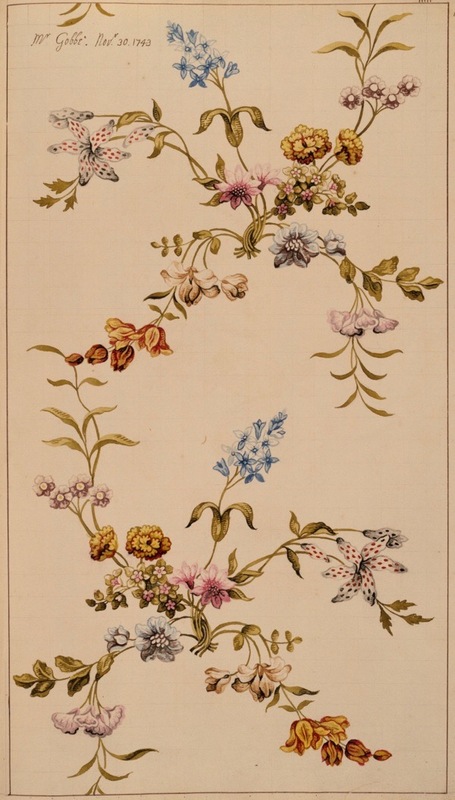 Eighteenth-century silk designers like Garthwaite were skilled labourers. They drew designs that showed weavers what patterns of colour and decoration to follow to create lengths of silk on their looms. Many designers were weavers or had trained as master weavers. Silk designers almost always worked independently, on commission. The London silk industry made all sorts of textiles but was most renowned for its flowered silks. Named for their floral or botanical patterns, flowered silks were distinctively designed, produced to order, and usually limited to only four pieces woven from a single design. Almost all Spitalfields flowered silk was meant for clothing rather than interior decoration or upholstery, used to make elegant dresses and petticoats for women and elaborate waistcoats for men. Fashion depended then – as it still does – on enticing consumers with novelty and variety. In the Spitalfields silk industry, it was designers like Garthwaite who had power to produce this desired variety. This was because from the seventeen-twenties to the late seventeen-fifties, when Garthwaite worked, novelty in eighteenth-century silk depended largely on the creation of new textile patterns, which changed more rapidly than the cut of clothing. A highly prolific designer, Garthwaite drew hundreds of patterns, their flowered silk designs blossoming in watercolour and pencil curves across grids of ruled paper. Her silks, with designs ranging from naturalistic flowers to stylised Asian patterns, spread throughout the Atlantic World. From Scandinavia to South Carolina, men, women, and children walked, ate, danced, and posed for portraits wearing Garthwaite-designed silks, like the one painted by Robert Feke in 1746 of a wealthy Philadelphia merchant’s wife, Anne Shippen Willing, which inspired my book. Her silks survive in museums across Europe and America as mutely shimmering testaments to her long-ago popularity. But Garthwaite’s success was improbable. Unlike many other known silk designers in eighteenth-century London, who tended to be of French Huguenot descent, she was English. Her distinctiveness lay fundamentally in the simple fact that she was a woman. Although other women certainly worked in London’s silk industry, few worked as silk designers. Garthwaite is the only woman whose designs survive. Most women who practiced skilled trades like weaving did so because their father or husband did too. Garthwaite, by contrast, did not ply her trade because a male relative had done so. Nor did she receive formal training or start her career as a young woman. Instead, Garthwaite, who never married, did not begin her professional design career until she was middle-aged. Moreover, her family background added to the improbability of her career choice. For Garthwaite was no weaver’s daughter. Instead, she was the daughter of a Cambridge-educated Anglican minister from Lincolnshire, with family connections to the Royal Society and the English nobility. How did this spinster daughter of a Lincolnshire minister manage, in her forties, to launch a successful London design career? How did she gain the technical expertise required to design complicated patterns? Why did she never marry? Some of these questions have no known answers. And unless a stash of previously unearthed evidence comes to light, some of them never will. Despite Garthwaite’s prolific career and popularity, she remains an enigma. Records make it evident that she was not only literate but educated and financially solvent. There is no obvious reason her historical trail should be so faint. Yet she left little more documentation than an anonymous, illiterate, impoverished woman of her time might have. There is minimal archival material beyond her will: no letters, diary, business or advertising records. Anna Maria Garthwaite’s story serves as a reminder that sometimes even the educated and well-known are silenced in traditional historical sources. Garthwaite did, however, leave a rich trove of objects and images. These speak for her. They include her house in Spitalfields, the silk woven to her designs, and more than eight hundred labeled watercolour designs. They can be read much like a diary, and they begin to give voice to this otherwise mute figure. Garthwaite’s Spitalfields townhouse was more than a home. It was also where she designed her patterns and conducted her trade. Of all the houses on Princes St, her corner house was one of the best suited for conducting business. Its two-door layout gave it a distinct advantage. The front door opened into a formal stair hall. 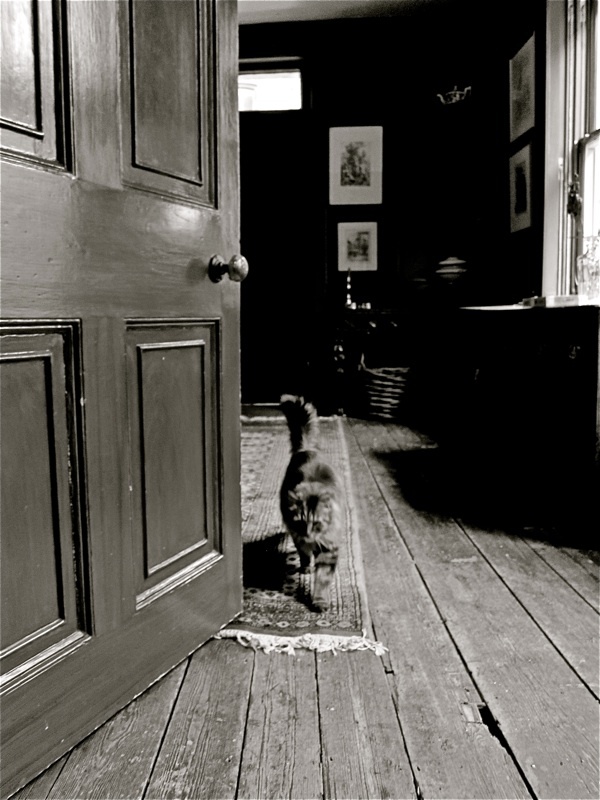 The other, on the street leading up to Christ Church, opened directly into a room separated from the rest of the house by an internal door. The family of women (Garthwaite, her widowed older sister, their young ward, Mary Bacon, and a few women servants) could come and go in private through the first door, leaving the corner ground floor room free for business activities. Business callers could enter the house without interacting with anyone besides Garthwaite or possibly a servant, while remaining similarly undisturbed by family noise and distraction. Above this ground floor shop was the genteel space of the first-floor drawing room. This particular room had two discrete but overlapping functions. It was a space of both labour and sociability. Decorated with the highest level of architectural finish in the house, this room would have been where the Garthwaite sisters entertained guests. It was also, however, very likely Garthwaite’s atelier, or studio. It was here that she sketched, painted, and transferred onto gridded paper her watercolour and pencil designs. Its corner location and large second floor windows had the practical benefit of strong, clear light for drawing and painting. Garthwaite’s studio drawing room was a room with a view. Out of this room’s windows, Garthwaite could see the mercers and master weavers who walked to her house to buy her textile designs. She also could see Christ Church Spitalfields, the church she and her sister attended and where they both would be buried. Perhaps this minister’s daughter found comfort in the familiar sight of an Anglican church and inspiration in its calm Palladian beauty. Certainly, architectural elements popped up in Garthwaite’s designs from time to time. Garthwaite’s designs were produced in Spitalfields, but they owed their existence to global natural history networks and the demands of the North American colonial market, the English silk industry’s most important market outside of London. Her popular designs both mirrored the larger British cultural fascination with gardens and helped foster a craze for wearing botanical landscapes in silk around the British Empire. Her designs shaped a shared visual experience throughout the British empire. In the seventeen-fifties and sixties, for example, women in colonial New York, Ireland, and England, for example, all wore dresses made of the same Garthwaite pattern—each woven in different colours (red, yellow, and pink). These women never met, or even knew of one another. Yet their lives materially connected by touching and wearing Garthwaite silk. Garthwaite, like the majority of the eighteenth-century Spitalfields silk designers whose work has been identified, had personal ties to London’s scientific community. But of these designers, Garthwaite was the sole woman. Garthwaite’s relationship with her brother-in-law apothecary Vincent Bacon—a fellow Spitalfields resident and a member of the Royal Society—was a particularly important one for fostering her ties to these networks. As a member of the Apothecaries’ Guild, which maintained it, Bacon had access to Chelsea Physic Garden—one of England’s great botanical gardens, filled with exotic flowers and plants from America and Africa. Women like Garthwaite frequented the Garden to view and sketch plants and flowers, a reminder that in eighteenth-century Britain, women did not serve as passive recipients of male knowledge about botanicals. Less obviously than Royal Society members or male apothecaries, but no less truly, Garthwaite and the women who wore her flowered silks were members of a global network in which the scientific and the fashionable coalesced. Some of Garthwaite’s most remarkable designs featured aloes. Aloes were one of the most fascinating of botanical species to Georgian gardeners. Along with their medicinal properties and exotic African origins, aloes’ considerable variety in appearance fascinated eighteenth-century botanists. Garthwaite accurately captured their celebrated diversity by drawing different types of aloes in a number of patterns, using distinctive, spiky leaves to set them apart. Garthwaite often combined more prosaic florals with these exotic plants, showing them growing intertwined and grafted together. Mingling the exotic with the local, Garthwaite grafted an aloe onto an English rose. Despite their botanical impossibility, she took care to draw the hybrid plants realistically, in a style that mimicked botanical drawings done from life studies. Her designer’s eye shows the same fascinated appreciation for plants embraced by Royal Society members. Woven into a brocaded tabby silk, her aloe-rose hybrid blossomed across a silk in which the multicoloured botanical plants and flowers floated on a cream background. Viewers of this silk saw something very similar to a botanical illustration on white paper. Garthwaite used North American plants that were the popular subjects of such illustrations, all of which could be found exported into London gardens, including magnolia, Turk’s cap lilies, and mountain laurel. Pennsylvania botanist John Bartram first sent live mountain – or what he called “common” – laurel plants across the Atlantic to London in 1735. By 1740, they had bloomed in England. Bartram also sent Turk’s cap lilies between 1738 and 1740. Only a few years later, both specimens also flowered in Garthwaite’s designs. Like gardens in England and North America, flowered silk was a material embodiment of the global culture of the curious. Far from being simply a frivolous fashionable commodity, flowered silk could signify its wearer’s participation in a global network of Enlightenment intellect. We are accustomed to thinking of how men (and some women) exchanged natural history knowledge through plant and seed specimens, in published books, and in exchanges of letters between the curious on both sides of the Atlantic. But in traveling around the empire, fashionable commodities like silk also transported natural history knowledge. This was especially important for women, excluded or under-represented as they were in groups like the Royal Society. A woman’s silk might advertise her erudite hobbies as well as her fashion sense. The same learned members of the Royal Society who enjoyed studying aloes surely would have enjoyed the puzzle of deciding exactly which aloe they were seeing on Garthwaite’s silk designs. A woman wearing a dress decorated with such aloes, at the same time, could use her silk to interject her own knowledge of such exotic botanicals into a conversation. In an eighteenth-century world that delighted in visual and verbal puns and allusions, they too might build transatlantic communities. Like the British Empire itself, Garthwaite’s designs were a mélange of the far-flung and the everyday, a blend of the European, African, Asian, and American. Each of these exotic sites of imperial expansion was present in her designs through the plants and flowers she included. From her small corner of Spitalfields, Anna Maria Garthwaite designed topographical textiles that mapped the botanical landscape of Britain’s global empire. In Portrait of a Woman in a Silk Dress, Historian Zara Anishanslin examines the worlds of the four people who produced, wore, and portrayed a single dress: Simon Julins, Spitalfields Weaver, Anna Maria Garthwaite, Silk Designer, Anne Shippen Williams, Philadelphia Merchant’s Wife, and Robert Feke, New England Painter. That’s Simpkin the cat, from Beatrix Potter’s Tailor of Gloucester, looking for his twist of cherry-coloured silk for the waistcoat commission! Wonderful. Thank you. Marvelous to view works by Anna Maria Garthwaite. Such a shame so little is recorded of the life of this brave lady who went against the expectations of her society in order to fulfil her rights to be creative. Her designes are beautiful. 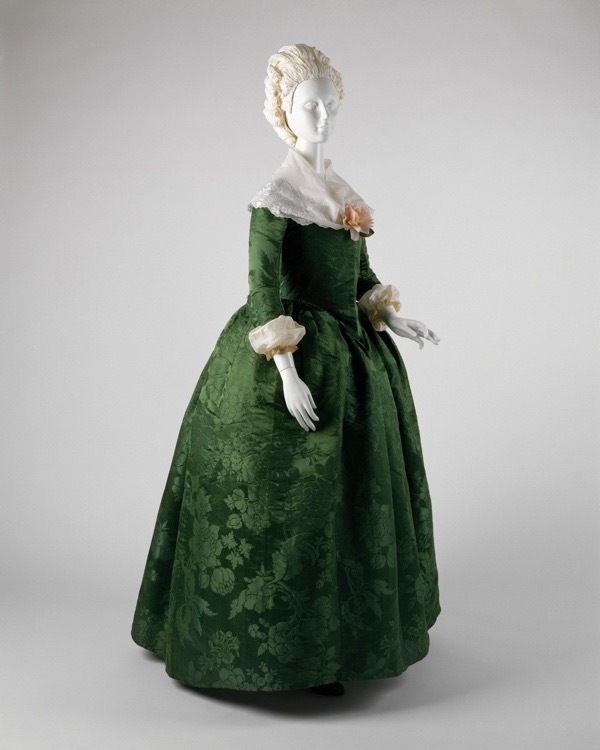 The green American Silk dress looks as splendid now, just think what it must have looked in 1775. 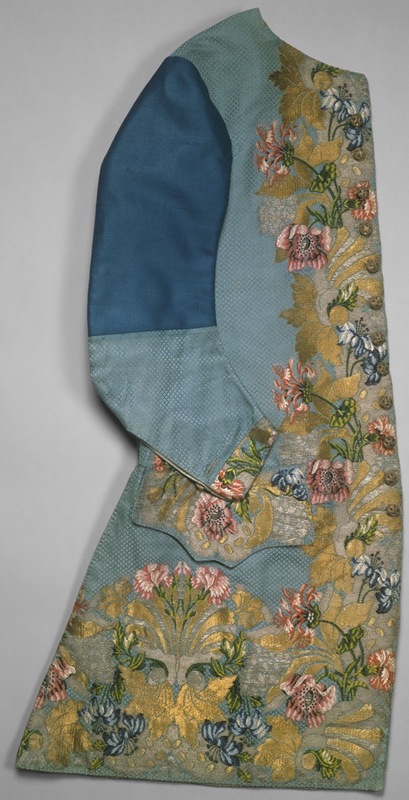 The colour and flower design of the waistcoat is masterful, one almost wishes one could go back in time for the pleasure of wearing these treasures. That so many talented women have been left out of the history books is shameful and yet these same people proudly fitted themselves out in the beautiful clothes Anna Maria Garthwaite created. To wear her designes is like walking in Kew Gardens itself. Let us hope that one day, someone somewhere finds a hidden little door behind which is hidden a chest containing the life and world of this great designer. Surely her written word is somewhere. That was a smart move of the sisters moving to Spitalfields it certainly enhanced Anna’s career. She never married perhaps because she was so fascinated with this design world, it was sheer dedication with a single mind set. I am sure her sister (no name) played some part in her business was she her mentor providing a support network or just a companion. Her designs were generally big broad flowery set pieces as shown, a 18th C fashion statement, yet she was capable of lovely ‘dainty’ tracery work. Similar artistic designs on paper can be seen at Kew. If she was alive today she would be big time and a good exporter. Poet John PS Has they known graves perhaps flowers could be laid-just a though at this special time. Such a shame that more isn’t known about the sisters but thank goodness the designs have survived. As someone whose ancestors were impoverished silk weavers around the Shoreditch High Street and St Leonards church area anything that provides me with a small thread of information to link me to them is much appreciated. Thank you. Absolutely brilliant article….thank you so much…Love to add this (with your blessing and credit) in the ever increasing re-write of my book on my Cavaliers….Weavers from Normandy 1560-2003. Fabulous, I really enjoyed reading this especially as it has a skill at botanical illustration at its heart. I cannot help but wonder just how beautiful straightforward botanical illustrations by this very talented lady would have been, but it is a delight to see some of her designs for silk fabrics shown here, that waistcoat is absolutely incredible, what a pity that men’s clothes have now become so boring by comparison!! Thank you, Gentle Author, for your wonderful blog. I read your offerings daily, and look forward to exploring Spitafields when I next visit London. Today’s blog is especially exciting because I am a great fan of Anna Maria Garthwaite’s work. I am an artist and from 1970 – 2011 I worked as a carpet designer in both New York City and Boston, Massachusetts. From 1993 to 2011 I worked for Asmara, Inc., Boston, as the in-house designer. About 15 years ago the company owner, Abid Ilahi, brought home three books on English silk designs from the V&A, and one of them featured Anna Maria Garthwaite. I immediately recognized in her work a similar design sense and use of sinuous lines and fanciful flowers that I have. I felt as though I had a rapport with her. The result of this joining of the minds is a carpet I designed for Asmara that was inspired by her work. In fact, the design I used is very similar to the one you used to illustrate this blog. My design is called “Branches” and has a similar skeleton on which I placed some of her flowers and leaves, and some of mine. The carpet is very popular and still sells very well. You can see it on the Asmara web site: http://www.asmarainc.com/products/branches-needlepoint-rug. The needlepoint carpet has 10 x 10 stitches to the inch, so it was possible to include a lot of detail. And because of the clever use of yarn mixed with different colored strands of wool, there are many more shades in the rug than the original 40+ colors I used when I painted it. (This was in pre-computer days, and I used very small brushes and Winsor & Newton Designers Gouache on illustration board.) By the way, despite not being credited in all the descriptive paragraphs on the Asmara web site, I designed all but eight of the carpets shown. I’m very happy to have had this interesting and productive career. I’ve seen photos of Garthwaite’s original paintings as well as the silk, and even though she (generally) painted on a grid with translucent water colors, her notes to the weavers are not unlike my own. Thanks once again for this blog about Garthwaite, and giving me a chance to share my work. I am very fortunate to be attending Zara Anishanslin’s reading and book signing tomorrow. Thank you so much to Elizabeth Moisan for your fantastic contribution above and the link to your work at Asmara. The rugs you designed are fabulous Elizabeth. Thank you so much for your kind words about my designs for Asmara. I worked very closely with the owner, Abid Ilahi, and together we produced beautiful carpets for many years. Since retirement, in 2011, I’ve been working as an illustrator and book designer. If you read this, please let me know how you came to know about Anna Maria Garthwaite. Hope the reading was fabulous.